I will be honest: I had never heard of this distribution until I received an e-mail 2 weeks ago. That was a request to review the Emmabuntus 2 Linux distribution from its developers' team. What is Emmabuntus? This is a French project oriented on “distribution for everyone”. 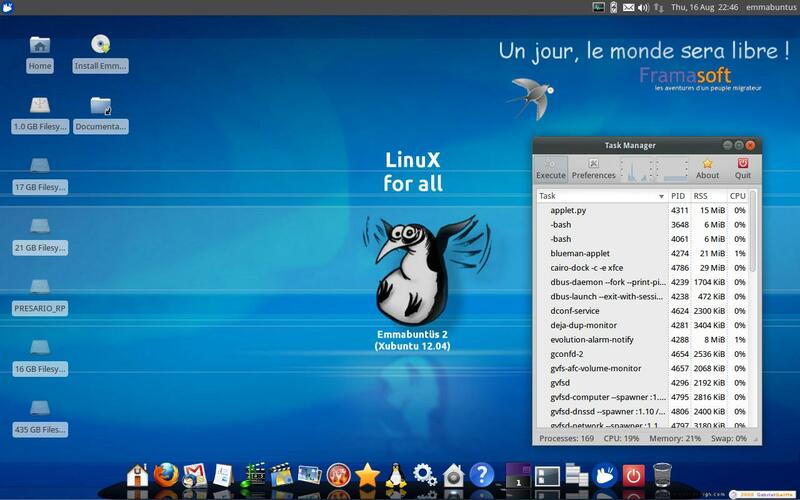 The latest version, Emmabuntus 2, is based on Ubuntu 12.04 and was released very recently, in August 2012. As long as I was invited, I decided to try the distribution. The ISO image of Emmabuntus 2 is very large. It is about 3 Gb. The project hosts on SourceForge. It means you have a selection of mirrors to choose from, and downloading speed is very decent. I used Unetbootin to "burn" the image to the USB stick. When the Emmabuntus 2 LiveUSB was ready, I plugged it into my laptop Fujitsu-Siemens Amilo Pi 1505. Reboot. Choose to boot from USB. Let's go! The boot menu, presented by Unetbootin, consisted of normal options: run Emmabuntus without installation, do memory check or boot from the first HDD. On top of that, there were three options to install the system in Dual Boot. I could not quite understand the difference, apart from the provided passwords for each installation option. Anyway, I selected the Live boot, and hit Enter. The boot process itself was rather long. I think this was the longest boot I've ever seen for the USB-based operating system. After running a wall of text, I saw the splash screen, which had logos for Ubuntu, Xfce, OOo4kids and about a dozen others. I think it does not benefit the system actually: useless information overloads the splash screen. Eventually, I got to the desktop, where the top panel appeared, and then some windows with questions were fired into my face. Unfortunately, some of these windows were placed on top of splash screen, and that looked ugly. The situation improved with time. First, Emmabuntus 2 asked me whether I want to install the dock panel. There was a warning that I should not run Dock if I want to install the OS, because dock covers important parts of the installation window. The second question was about additional multimedia software. There were checkboxes for Flash plugin and multimedia codecs. My choice was to install all the codecs, Flash and the dock panel. It took some more time to process. And only after that did the system leave me alone. It was the time for me to check the resource usage of the Emmabuntus 2 operating system: only about 210 Mb of memory! That's a pretty good result, bearing in mind that several heavy applications were installed in the Live USB run. Here I'd like to draw your attention to the fact that installation of additional software happened even before I connected to the network! 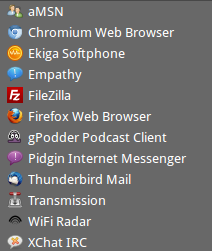 All this software is included in the 3Gb of the ISO image, which is handy. 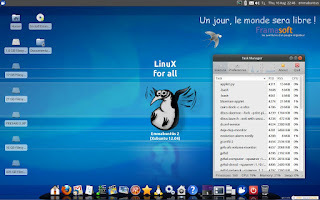 Technically, Emmabuntus 2 uses Xfce 4.8 on top of Linux kernel 3.2.0-26. The desktop in Emmabuntus 2 has a panel at the top with a dock (Cairo) at the bottom. The dock appears when you move the mouse cursor toward the bottom part of the screen. Otherwise it does not appear. From my perspective, the dock behaved itself reasonably well, and was not too annoying. Even though I usually turn off all the docks, I did not do it this time. The default wallpaper in this distribution is an image similar in theme to the splash screen: the stylish funny flying penguin, FramaSoft logo and a motto in French. FramaSoft, I believe, is a company that supports the distribution. There are about half a dozen alternative wallpapers available out of the box, mostly from Ubuntu 12.04 and Xubuntu 12.04 galleries. The Dock contains applications and groups of applications. If you run the application, it appears in the dock as highlighted, but does not appear on the top panel. It is not convenient from my point of view, especially if the application is actually part of some dock's group. It takes significant time, plus few clicks and mouse moves, to find and switch to the application you need. I realized that the best way to switch the applications in Emmabuntus 2 for me was the Alt-Tab hotkey. The top panel has the menu button in the top-left corner. This button has an Xfce logo on it. The right part of the panel has a usual set of indicators in the notification area: clocks, username, network monitor, message service, volume control, battery status. In other words, nothing is different from Xubuntu 12.04. By the way... Clocks showed my local time minus one hour. I definitely was not in Morocco or Iceland. I was in London. Emmabuntus 2 is based on Ubuntu / Xubuntu 12.04. It means I had no problem with connection to the network using my wireless network card Intel 3945 ABG. It literally took me few seconds. The default keyboard layout in the default distribution is English US. 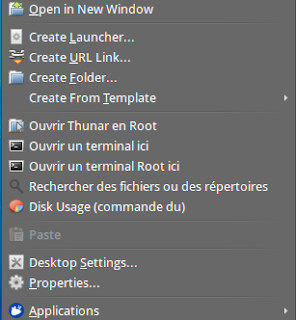 Emmbuntus 2 uses Xfce 4.8. It means that I used the backwards process, normal for Xfce, to configure the keyboard layouts. First, I added the keyboard layouts indicator to the top panel, and then configured the layouts: English UK + Russian with Ctrl-Shift as a switch hotkey. By default, the indicator is a flag, but you can change it to text. Flag is my preferred option anyway. I will repeat: the size of the ISO image of Emmabuntus 2 is 3 GB. To compare, the default Xubuntu 12.04 fits the 700 Mb CD. What is the difference? You got it right: the set of applications. This is way too much for the normal user. I won't bother you with a list of applications, instead I'll give you screenshots of some menu sections. 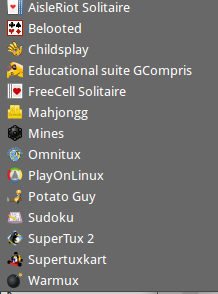 On top of Linux applications, Emmabuntus also includes PlayOnLinux and Wine. If you want to add or remove software from Emmabuntus 2, you can use Synaptic or Ubuntu Software Centre. There is no point to list available applications there, because it is Ubuntu's repositories plus a couple of dozen PPAs, including Linux Mint. If you remember, I recently reviewed quite a lot of distributions, which had issues with connectivity to my home fileserver. 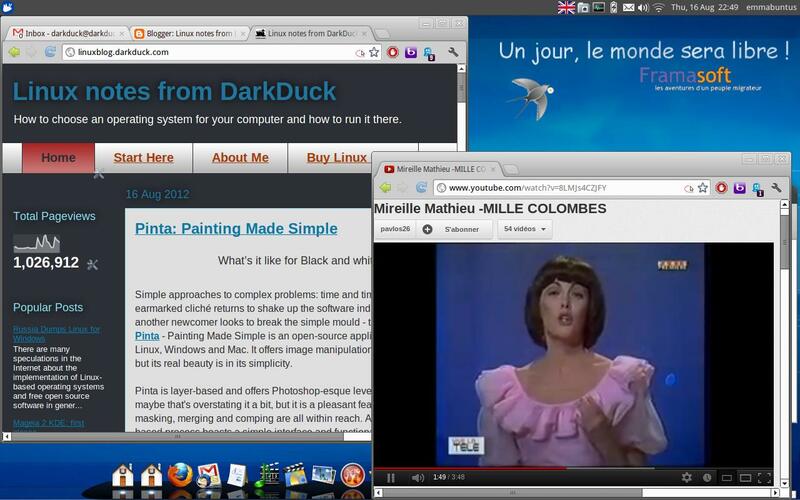 All of them are based on Ubuntu 12.04: Zorin OS 6, Linux Mint Maya 13 Cinnamon, Linux Mint Maya 13 MATE. Neither of these distributions could reach devices within my home network due to some DNS resolving issues. I was little bit scared to try the connectivity in Emmabuntus 2 after all these failures. My dreads were in vain. I could ping the fileserver in the terminal. Gigolo helped me to connect to the fileserver's partition in almost no time. Thus, I can deduce that the network connectivity problem in my previous tests comes from the combination of Ubuntu+GNOME, both GNOME2 and GNOME3. This is what all these distributions have in common. In contrast, Ubuntu + Xfce or Fedora + GNOME3 did well. Once I got the connection to my home file storage, I tried to play MP3 files from there. The default player for MP3 in Emmabuntus 2 is Audacious. As long as I installed all the necessary codecs at the very beginning of my Live USB run of Emmabuntus 2, I faced no issues whatsoever with my playback. The Flash videos also played well in Chromium. Generally speaking, I saw nothing wrong in Linux operating system Emmabuntus 2. It worked well. The system was fast and responsive. Even the bulky ISO image did not affect the performance. I felt the Live USB run of Emmabuntus 2 behaved no differently from my installed Xubuntu 12.04. Unfortunately, the French roots are visible in the distribution surprisingly often. 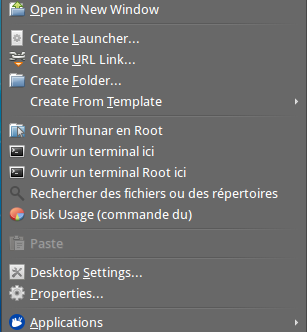 To start with, the right-click menu contains some items in French. Second, when I opened GMail or YouTube pages in the Chromium browser, I saw the French landing pages. It means that somewhere deep below the surface developers set up the French locale as default. I don’t think this is difficult to change, but I still consider it as a superfluous step for the non-French users, unless the distribution aims primarily at francophone people. But if it does, then why does an English version of the distribution exist? The third issue, which is quite important, is obesity of the distribution. It can be OK for patient people who do not have good internet connectivity, but want to get the system with all the possible software under their fingertips. However, that's not good if you want to have only applications you want: you will spend time to download the distribution plus, I think, even more time removing the bits you don't need. That well describes the potential users of the system: people who are not well introduced into the world of Linux, so they don't know exactly which applications they prefer, and who have weak or no Internet connection. They will have plenty of applications to try and make their own judgment. Does Emmabuntus have competitors that are more suitable for an English-speaking user? I think, yes. They are Pinguy and Zorin OS Ultimate, though the latter is paid option. It looks like the developer team went for the napalm approach to package inclusion. We don't know what the users will want so we will give them everything, not only that we will give them at least 2 of everything. This distro was designed to facilitate the refurbishing of computers given to human help associations, especially Emmaüs communities (where the name come from) and promote the discovering of Linux and GNU by beginners. This thousandth Linux distro is intended to be sleek, accessible, equitable. I am happy this guy has his own way. Let me have mine. The collective Emmabuntüs announced on September 21, the output of the first maintenance release of the Emmabuntüs 2, based on Xubuntu 12.04.1.